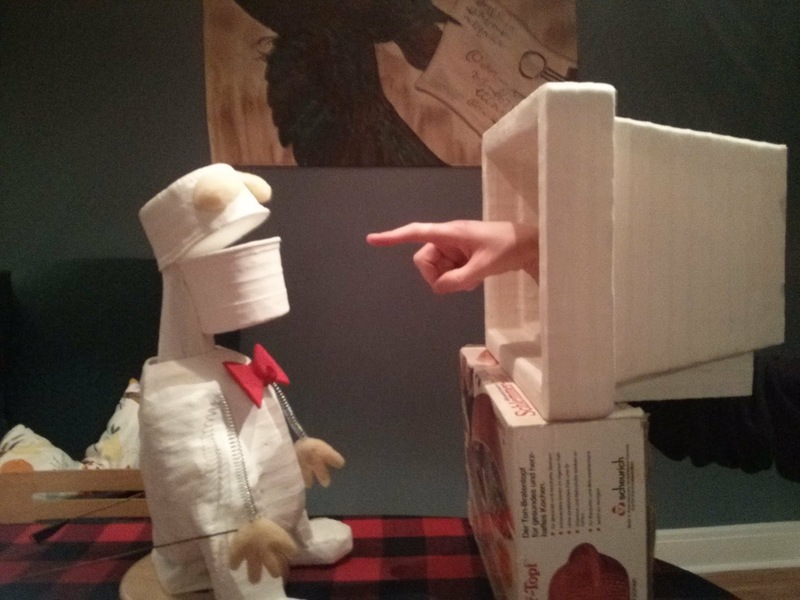 I built the original Mumford at Mermaid Theatre's Animotion. 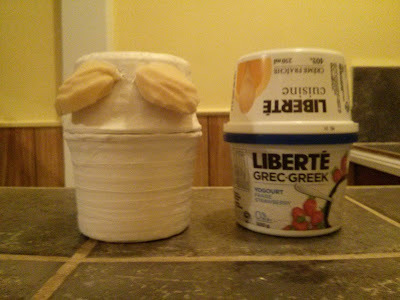 We were given a bunch of empty containers of various shapes and told to make something. As a result, he was the first puppet I ever built that I didn't design first -- I just started building and saw where it took me. I made a big mouth out of yogurt containers and a fat little body out of a milk jug. With those features, I thought maybe he should be an opera singer, which is why I gave him a bow tie and permanently closed eyes. 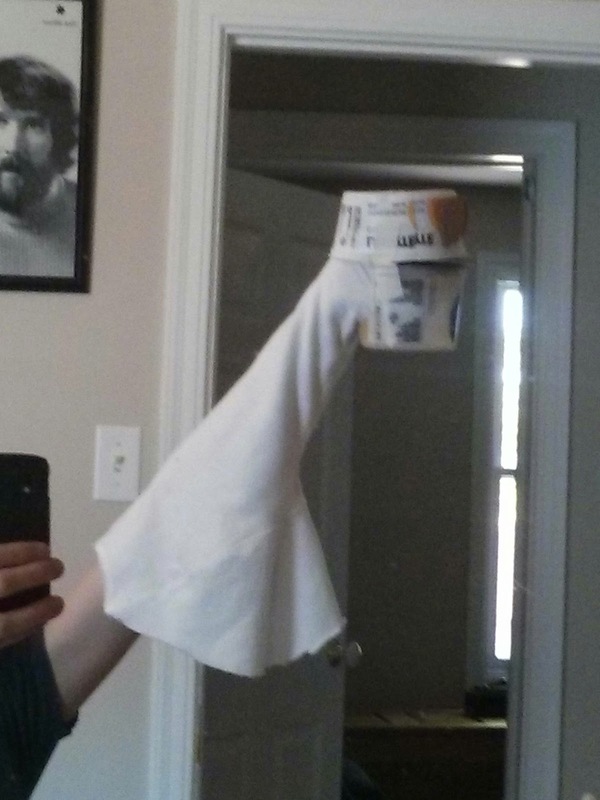 His springy arms were inspired by Tom Servo of Mystery Science Theater 3000. When I started performing him, he developed a nonsense dialect, and his character fell into place more easily than any other puppet I'd made. Flash forward to now, and I'm working on a routine wherein a puppet watches TV and things fly out of the screen at him. The audio will be a collage of real clips from television, the crummier the better. Originally it was going to feature Moss as the unlucky protagonist, but I quickly realized that it should be Mumford instead, the poor hapless guy that stuff just happens to. 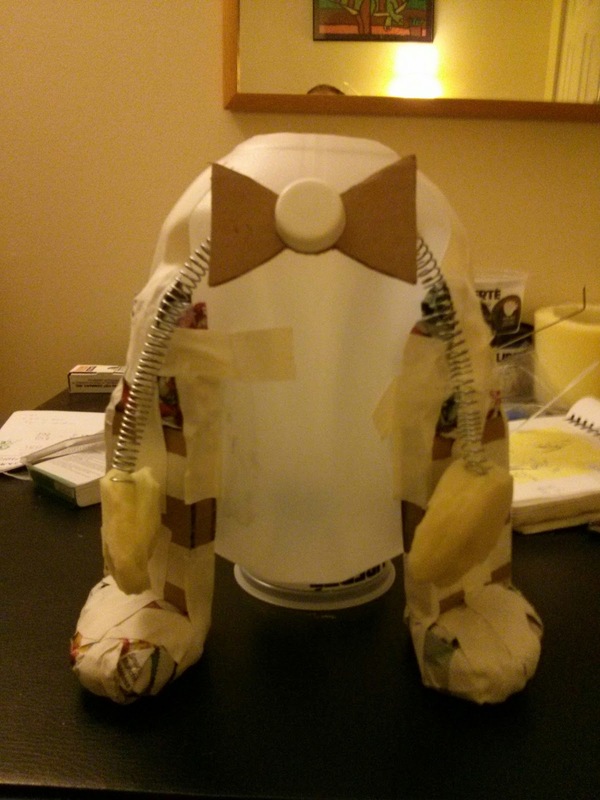 This meant that I'd have to build a new version of Mumford, one that could be manipulated from below, Muppet-style. So, I set to work. 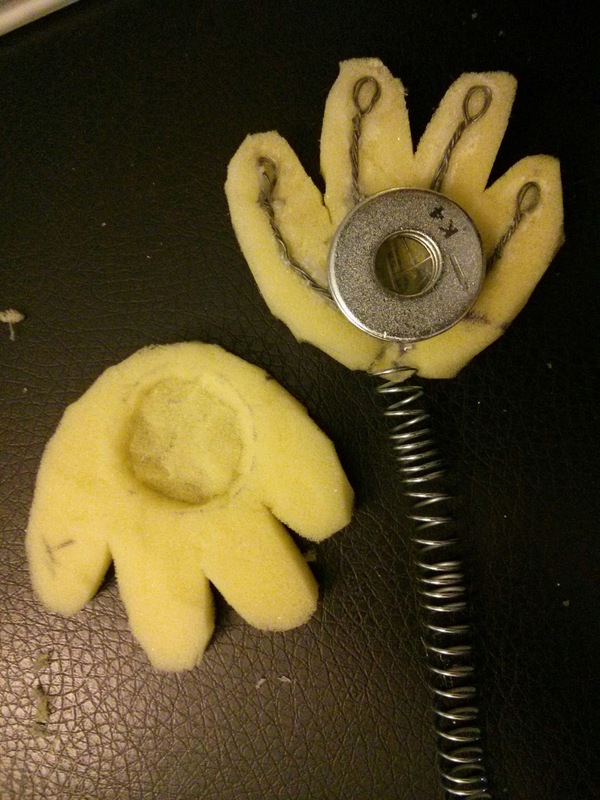 The new Mumford's hands included two features I'd never used before: removable arm rods and poseable fingers. For both, I took a lot of inspiration from Kim McFarland's amazing Fraggle puppets. I cut a hand shape out of a piece of foam, then sliced it down the middle to create two halves. 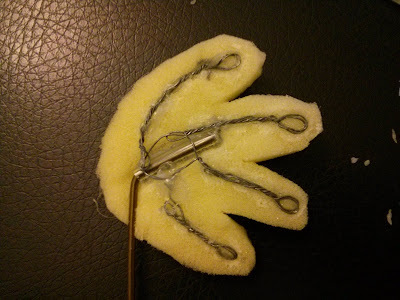 On the inside of one of the halves, I glued a long piece of wire, twisted and bent into four fingers. I also glued in a short piece of plastic tubing, the right width to accommodate a piece of coat hanger bent at an angle. 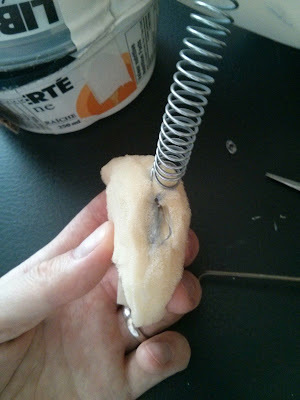 For his arms, I bought a spring and stretched it out slightly with pliers. As with the tabletop version, his hands needed to be weighted so that his springy arms wouldn't just stick out to the sides. 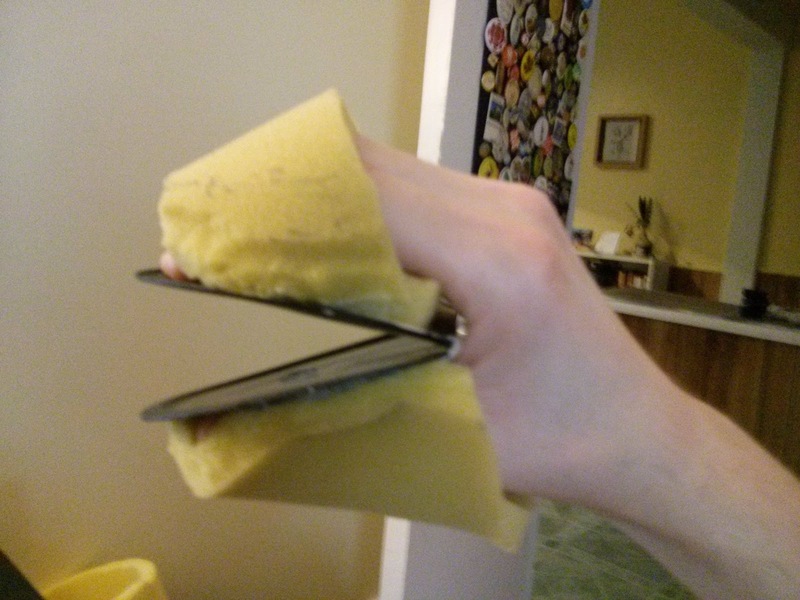 I used three washers per hand, gluing them to the inside of one half, and cutting a depression into the inside of the other half. Once I'd glued the two halves of the hand together (leaving a gap at the back of the hand so that the arm rod could be inserted and removed), I used scissors to sculpt the hands into a more refined shape. Later on, I would add another piece of plastic tubing, in the same orientation as the vertical part of the arm rod, but with a slit cut in the back for inserting and removing the rod. This prevents the hand from twisting around the rod's axis. You can see this tube protruding in the picture below; I ended up trimming it to be shorter than this. I actually had a hard time finding a 4 litre milk jug -- in (Upper) Canada, milk comes in bags! 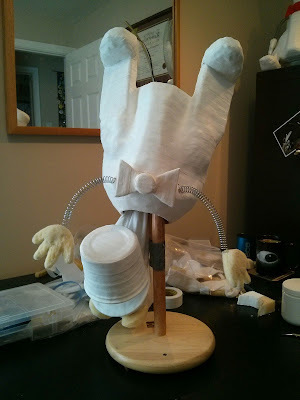 -- but once I found one, I attached the arms, the bow tie (made of cardboard and a pop bottle lid), and the legs (made of cardboard and crumpled newspaper). I discovered that working the arms with rods from below meant that they needed to be longer than they were in the tabletop version; I would later move the legs lower on the body to accommodate these proportions. But while the tabletop head was controlled from behind, with holes in the back of both the upper and lower jaw to stick my fingers in, the head in the new version had to be controlled from below. It needed a natural-looking neck, yet I wanted to still be able to open the mouth as wide as possible for the sake of expressiveness. 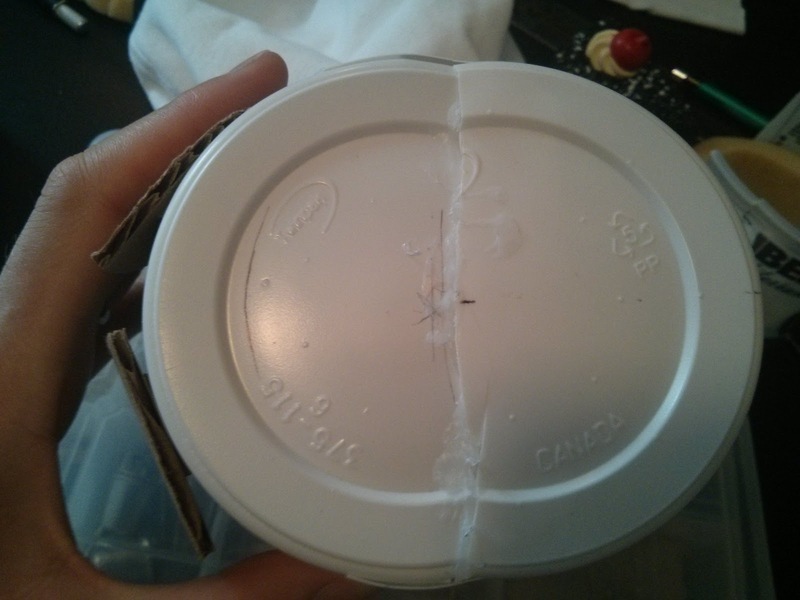 So there was lots of experimentation (and many wasted yogurt containers) as I tried to figure out the best place to put the hinge and holes. (Luckily, I got a lot of yogurt for free from my job at the Herb & Spice Shop.) For help, I reached out to Michael Schupbach of the Puppet Kitchen, whom we met while honeymooning in New York City. 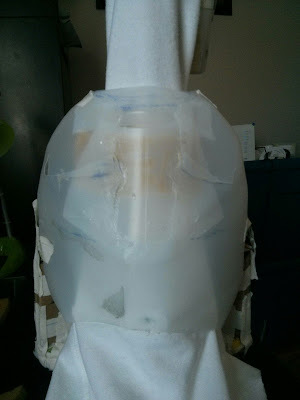 Taking his advice, I made the upper part of Mumford's head longer by combining two containers of the same size, extending the head backwards to cover my hand completely. This way, my hand entered the upper jaw from below, so there was no need to put a hole in it, only in the lower jaw. This looked a lot more natural. I used foam to make hand grips on the mouth plate, which is made from the lids of the yogurt containers. For the neck, I used a white sweatshirt sleeve, taking another suggestion from Michael Schupbach. I attached the neck to the body at the bottom of the body, giving the neck freedom to move at the top. As with the tabletop version, I sculpted his eyelids out of foam with scissors. I removed the handle from the back of the milk jug and did some reconstructive surgery, supplementing with bits of an empty vanilla jug I got from work. 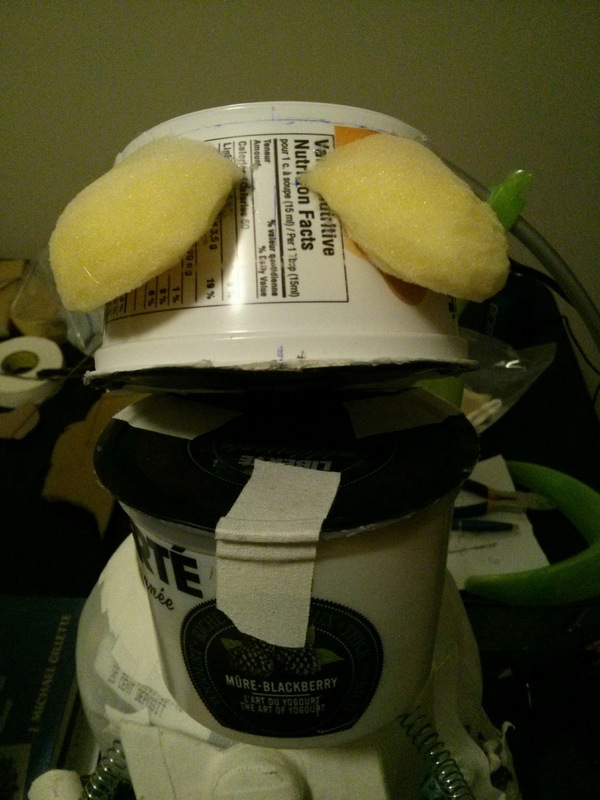 I put some foam on the inside of his back to adjust the position of my arm, and I made the neck hole a neat oval. The structure completed, I then covered his head and body with two layers of hockey tape, a wonderful material I learned about at Mermaid Theatre that takes paint very well. I painted his head and body white and his bow tie red. Here he is hanging upside down so that I can paint his legs. And here's the completed Mumford, with a (still unpainted) prop TV that I made from a Styrofoam cooler for the skit I'm putting together. When Mumford walks across the stage, I plan to grip one of his legs with my left hand and use that to manipulate his body in a walking motion. This will help create the illusion of a floor underneath him. For years, I was obsessed with the idea of trying to manipulate the legs of a puppet that was visible only from the waist up, figuring that even that barely visible movement of the legs would enhance the reality of the puppet (an obsession which culminated in Moss' legs walking on a carpet). Since Mumford started out as a tabletop puppet, this kind of movement is already built in.